NBC5's definition of news long has been looser than its competitors. Even so, the Fort Worth-based station outdid itself last week with a quintet of 10 p.m. newscast "reports" that played much more like Hot on Homes segments. That's the half-hour infomercial currently airing Sunday mornings on CBS11 after previously residing on WFAA8. Assisted by the DFW Metrotex Association of Realtors, NBC5's Lindsay Wilcox gushed about three available homes per newscast, with prices beginning in the $150,000 range Monday and ending with a trio of million dollar babies on Friday. A Richardson mini-mansion, for instance, "features a media room the kids will love and whimsical bedrooms where their imaginations can soar," Wilcox trilled in her closing segment. Another home, resembling a castle on the outside, includes "a master bedroom fit for a king and queen." Throughout the week, various realtors also chimed in with their praises of the properties they're trying to unload. At NBC5, credibility is for sale, too, although that's really nothing new. Thinly disguised infomercials regularly inhabit the station's 10 p.m. newscasts, home of "Big Fat Savings" segments that amount to wet kisses for various area merchants. The station's owner, NBC Universal, is super-bullish on in-program "product placement" arrangements. So why should newscasts be exempted? An unclebarky.com reader and journalism school graduate who saw some of Wilcox's segments sent a plaintive email that asked in part, "Has station management completely sold their soul? How can the station's 'news professionals' go along with this?" NBC5 in fact still has some solid, resourceful reporters -- Randy McIlwain, Scott Gordon, Ellen Goldberg to name some. But virtually every reporter at every TV station or newspaper in town is afraid to speak out for fear of losing their jobs or getting suspended. That goes both internally and externally. You keep your mouth shut -- period. And in times of rampant downsizing, the paranoia is all the more palpable. In fact it's not even paranoia. It's a stone-cold reality. My feeling is this. 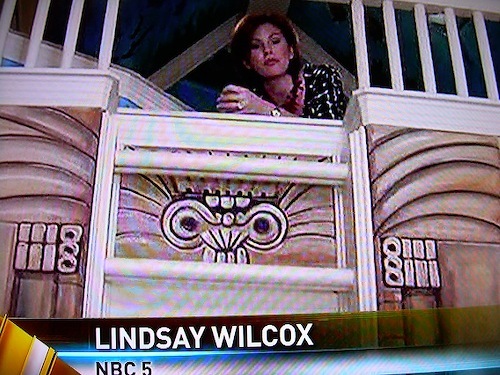 If week-long infomercials such as Wilcox's represent local TV newscasts of the future, then simply replace them with a game or talk show and move on. You'd be performing a public service. Which oddly enough is what newscasts used to be. 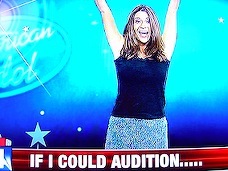 Fox4's Good Day ignores North Texas Idol auditions -- NOT!!! 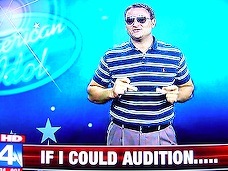 Let no one accuse Fox4's Good Day of over-covering Friday's American Idol auditions at Jerry's Palace in Arlington. After all, the station had only 10 live and lengthy cut-ins to reporters Fiona Gorostiza and Dan Godwin during the 5 to 9 a.m. run of the show. Oh, but we kid the troopers at Fox4 news. Because in truth, any of their three principal D-FW competitors would have done pretty much the same thing if one of their networks had prime-time's runaway most popular show. It's just that Fox4 has two more hours to burn than their morning counterparts, which have to give way at 7 a.m. to Today, Good Morning America and The Early Show. On Friday that made Good Day seem awfully Idol-heavy in the long run, even if Fox4 also made ample time for other national and local stories of import. That said, Godwin can be awfully grating under any circumstances. On Idol Friday, he milked the same labored angle almost every time around. Namely, the "sad irony" of Michael Jackson's death on the day before the North Texas auditions, which "has tempered the festive atmosphere," Godwin said time and again. With a "very important audition" at stake, "might that sort of interfere with your focus today?" Godwin solemnly asked one Idol hopeful. Yeah, right. How many viewers tempered their impulse to throw something at the screen? Gorostiza is lots easier to take, even if some of the impromptu singing she coaxed oftentimes wasn't. In the 7 a.m. hour, she found a woman named Krystal who said she had unsuccessfully auditioned for seven previous Idol editions. "It is what it is," said the would-be contestant, resorting to the already worn out fallback position that former Dallas Cowboys receiver Terrell Owens also deployed after being humiliated on Monday's premiere episode of ABC's The Superstars. Then poor Krystal sang a little Faith Hill. At least she didn't shatter any crystal -- that we're aware of. Reporters Fiona Gorostiza, Steve Noviello also cleared their throats. 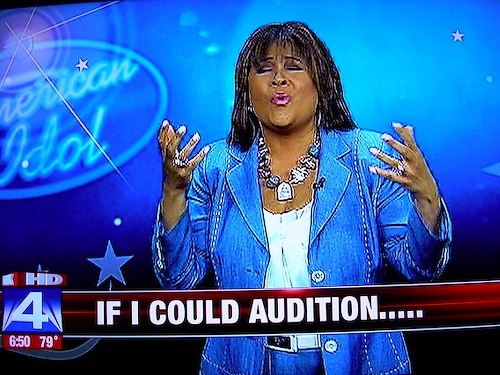 Fox4 also had the tolerable idea of letting willing anchors and reporters sing the songs of their choice in front of an Idol logo in a series of "If I Could Audition" snippets. Participants included Gorostiza, news anchor Clarice Tinsley, reporter Brandon Todd (the station's regular "Idol Insider" correspondent), traffic reporter Chip Waggoner, Deal or Dud dude Steve Noviello and substitute Good Day anchor Krystle Gutierrez. News purists might be in full-scale revolt. But it's a morning show, it was the end of a long, hot week and the so-called respectable anchors of the network morning shows regularly do a lot worse. So let's just note that Gorostiza and Todd had the best time with it, Gutierrez has the best voice and Tinsley shouldn't let easily frightened small children anywhere near her rendition of "And I Am Telling You I Am Not Going" from Dreamgirls. Here are the song stylings of Tinsley, Gorostiza and Todd. The rest are available here. The new era digital-only ratings seemed to perk up ever so slightly Monday. Still, some D-FW station managers might still be dipping into the Digitalis. CBS11, which had suffered from severe ratings shrinkage in the early going, notched its first newscast win in the post-analog age by drawing the most total viewers at 10 p.m. The station's grand total of 186,004 edged runnerup WFAA8's 172,718. NBC5 prevailed, however, among 25-to-54-year-olds, the main advertiser target audience for news programming. CBS11 slid to third. WFAA8, which also had been a 98-pound weakling of sorts, flexed a bit in the 6 p.m. slot it used to dominate. The station won in both ratings measurements, increasing its viewer haul in small increments from last Monday's first full weekday of digital results. Fox4 and NBC5, so far the least affected by the digital switchover, respectively ran the table at 5 p.m. and 6 a.m. Some readers have said the signals from WFAA8 and CBS11 can be harder to come by via a non-cable/satellite TV set hooked to a new era converter box. If so, that's a hard pill to swallow -- Digitalis or otherwise-- in these still dispiriting economic times. The prime-time network ratings were paced by ABC's 7 to 9 p.m. edition of The Bachelorette, which swept its time slot among total viewers, and CBS' quartet of sitcom reruns, which did likewise among advertiser-craved 18-to-49-year-olds. CBS' CSI: Miami reprise won at 9 p.m. in total viewers, with NBC's competing Dateline taking the 18-to-49 gold. NBC's two-hour I'm A Celebrity . . . Get Me Out of Here again stunk it up, running an out-of-the-money fourth in total viewers and beating only Fox's Lie to Me rerun among 18-to-49-year-olds. CW33's struggling 9 p.m. local newscast had a better night than usual, particularly among 18-to-49-year-olds. Its 32,412 viewers in this demographic at least were in shouting distance of Fox4's competing local newscast, which drew 55,100 viewers in the 18-to-49-age range. Nielsen Media Research caught up with itself by early Monday afternoon, and now is back in the business of reporting the previous night's ratings on the following morning. The historic switch from analog to digital, on June 12th, had kept local TV stations on waiting lists for a week while the nation's numbers counter coped with the change. Some D-FW stations would just as soon wait a little longer for the dismal ratings they're receiving of late. Count WFAA8 and CBS11 among the almost missing in action Friday at the newscast hours of 5 and 6 p.m. Both stations struggled to stay above the water line in the key 25-to-54-year-old news audience demographic favored by most advertisers. WFAA8 had just 19,447 viewers in this age range, barely edging CBS11 (16,206) in the 5 p.m. competition. Fox4 took the top spot with 64,824 viewers of the 25-to-54 persuasion. At 6 p.m., WFAA8 dipped to 16,206 viewers in the 25-to-54 field while CBS11 sagged to 6,482. Even so, that was better than the preceding CBS Evening News, barely breathing with a pitiful 1,945 viewers in this key demographic. Fox4 again took the gold with 58,342 viewers. The total viewer crowns at 5 and 6 p.m. respectively went to Fox4 and NBC5, with the Peacock also topping the 10 p.m. ratings in this measurement. NBC5 and WFAA8 tied for first at 10 p.m. with 25-to-54-year-olds, where it was Fox4's turn to have that sinking feeling. It ran an out-of-the-money fourth with 25,930 viewers in this age range, compared to 51,859 apiece for NBC5 and WFAA8. The Peacock remained a model of consistency at 6 a.m., again romping to twin wins. The 9 p.m. local news on KDAF-TV (The 33) continued to feel the pain of the digital age, drawing just 13,286 total viewers, 9,724 of them in the 25-to-54 demographic and 3,369 within the CW network's target 18-to-34 age range. NBC's coverage of the rain-soaked U.S. Open golf championship, which didn't end until Monday afternoon, dominated the Saturday-Sunday sports ratings. Saturday's audience peaked at 146,146 total viewers between 5:45 and 6 p.m. Sunday's coverage had a high of 265,720 viewers between 6:45 and 7 p.m. So how are the local newscast ratings holding up in the full-blown digital days? As you can see, some of the digital/analog shortfalls are jarring, particularly in the week-to-week results for Wednesday's 6 p.m. and 10 p.m. newscasts. But the severe storms of Wednesday, June 10th gave those newscasts a ratings boost. And stations also are showing analog-to-digital audience gains on occasion. CBS11 consistently seems to be taking the overall heaviest hits so far, with WFAA8 also experiencing some sharp drops. Still, it's too early in this game to draw any quick conclusions. All of the stations obviously hope that the digital vs. analog scorecards eventually will be more evenly matched. But in the first three full weekdays of digital, the "combined viewership" drop-offs far outnumber the gains. And my head is spinning after tabulating all this stuff. 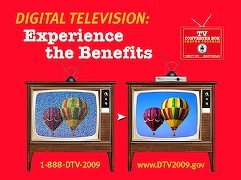 The first local ratings returns of TV's digital age are in, even though they're a week old. But they'll be arriving at a faster clip now. Results from Friday-Sunday (June 12-14) include two sporting events that now seem like ancient history -- Game 7 of the Stanley Cup Finals and the concluding Game 5 of the NBA Finals. Pittsburgh's upset hockey win on Detroit's home ice, which aired Friday night on NBC during Digital D-Day, drew 106,288 D-FW viewers against the competing Rangers-Dodgers game on Fox Sports Southwest, which edged the pucksters with 112,931 viewers. But hockey had more advertiser-coveted 18-to-49-year-olds. Sunday's closeout of the Orlando Magic by the Los Angeles Lakers drew 305,578 total viewers to dominate the prime-time Nielsens. It likewise had a big haul of 18-to-49-year-olds. In Friday's local news derby, WFAA8 won the first digital matchup at 10 p.m. with 212,576 total viewers. That's a better showing than on the previous analog Friday, when WFAA8 led at 10 p.m. with 179,361 viewers. But the June 12th lead-in audience from ABC's 20/20 also was a bit larger. WFAA8 also ran first at 10 p.m. among 25-to-54-year-olds, the main advertiser target audience for news programming. It again did better in this measurement than a week earlier. NBC5 continued its winning ways at 6 a.m. with golds in both total viewers and 25-to-54-year-olds. Fox4 likewise swept the 5 p.m. competitions and also notched a win at 6 p.m. with 25-to-54-year-olds. WFAA8 finished first at 6 p.m. in total viewers. Weatherman Pete Delkus served as point man Friday for Dallas-based WFAA8's last gasp of analog programming before the digital switch hit the fan. It's a nice sendoff/infomercial, with Delkus extolling the virtues of WFAA8 (originally KBTV) before viewers get a last look at the station's still majestic sign-off from the 1960s and '70s. "As this day in beautiful North Texas comes to an end, we hope we've been a pleasant part of your day," a woman narrator says before bidding viewers nighty-night. The warm-fuzzies lead directly to the fuzzy demise of analog. Have a look. It's worth it. 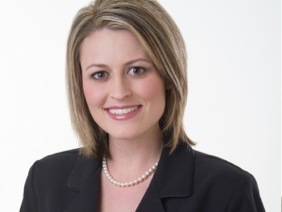 Reporter Melissa Newton, laid off by NBC5 in mid-May, is joining CBS11 as a freelance reporter. 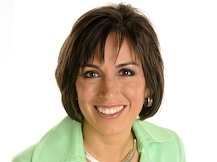 CBS11 news director Scott Diener confirmed her hiring in a staff memo sent out Friday. Her first day at the D-FW station will be June 27th. Newton worked the early morning shift at rival NBC5 after arriving in December 2007. The Texas Tech graduate previously had been a reporter and anchor for two Oklahoma City stations, KOKH-TV and KOCO-TV. Between NBC5 and CBS11, Newton worked briefly as a freelancer for KDAF-TV ("The 33)," which carries the CW network's programming and has a nightly 9 p.m. local newscast in D-FW. Hello, and happy/sad Digital Conversion Day. This is the last "Snapshot" under the old regime, with broadcast stations far and wide hoping and praying that their ratings won't tumble after analog goes dead at various times Friday. The NBA was happy to get in under the wire Thursday with Game 4 of the Lakers-Magic matchup, won in OT by the visitors on Orlando's home floor. D-FW ratings zoomed during the closing half-hour of a game that stretched through local newscasts and also cut a swath through O'Brien/Letterman before ending at 11:16 p.m. Lakers-Magic drew a king-sized 584,584 viewers during those concluding 30 minutes, all but obliterating the audiences for both CBS' Late Show (93,002 viewers) and NBC's Tonight Show (86,359 viewers). Overall, ABC's Game 4 averaged 431,795 viewers, with more than half that total -- 236,608 -- in the advertiser-coveted 18-to-49 age range. Had the Magic's Dwight Howard made just one of two free throws at crunch time, we'd be talking about a 2-2 series tie and more ratings riches for ABC. But now Orlando's doomed, whether or not it staves off elimination by winning Sunday night's non-lustrous Game 5. In Thursday's 7 p.m. hour, NBC's I'm a Celebrity . . . Get Me Out of Here won by default with 172,718 total viewers opposite repeats on Fox and CBS plus pre-game filler on ABC. Opposite the prime-time portion of Game 4, CBS' repeat of CSI: Crime Scene Investigation fared best with 186,004 viewers. Fox4's 9 p.m. local newscast had the best non-basketball prime-time performance among 18-to-49-year-olds, drawing 87,512 of 'em. In local news derby results, CBS11 won a downsized three-way 10 p.m. competition in both total viewers and 25-to-54-year-olds, the primary target audience for news programming. Fox4 nipped both NBC5 and WFAA8 in total viewers at the 6 a.m. hour. But the Peacock prevailed with 25-to-54-year-olds. WFAA8 notched twin wins at 5 p.m. and NBC5 did likewise at 6 p.m.
KTLA weather clown prompts an obvious question: Is this really an upgrade for former Fox4 anchor Megan Henderson? Good Day's ratings haven't been the same since co-anchor Megan Henderson left the station after the February "sweeps" to join L.A.'s KTLA-TV on a similar early morning shift. Fox4's waker upper since has fallen to a pretty distant second place at 6 a.m. behind NBC5 while station management searches for a permanent replacement to accompany incumbent Tim Ryan. Meanwhile, Henderson keeps her sunny side up, even in the company of KTLA weather clown Mark Kriski. In this recent footage, she can be seen several times with co-anchor Asha Blake during the course of Kriski's over-the-top twitting of traffic reporter Ginger Chan. How cringe-worthy of him. Is this really what Henderson signed up for? Oof. Conan O'Brien's second Tonight Show fell half a rating point from the first but continued to dominate David Letterman's Late Show on a night when NBC also made a little noise in prime-time. Tuesday's Tonight drew 172,718 D-FW viewers, down from 205,933 for O'Brien's opening night. Letterman pulled in second with 86,359 viewers, up from Monday's 73,073. O'Brien also called the tune with advertiser-coveted 18-to-49-year-olds, pulling in 84,271 Tuesday opposite Letterman's 29,171. On Monday, the score was 110,201 to 32,412. In prime-time, the second dollop of NBC's I'm A Celebrity . . . Get Me Out of Here drew 99,645 total viewers in finishing a distant second to CBS' NCIS repeat (265,720 viewers). But in the measurement that matters most to NBC -- 18-to-49-year-olds -- I'm A Celebrity topped the 7 p.m. standings. The Peacock ran second in both measurements at 8 p.m. with its Inside the Obama White House special, anchored and reported by Brian Williams. At 9 p.m., NBC's season finale of Law & Order: SVU had the network's largest audience of the night -- 232,505 total viewers. That was good enough to edge CBS' 48 Hrs. Mystery (225,862 viewers) before the two shows traded places among 18-to-49-year-olds. The Texas Rangers' lopsided road loss to the Yankees on MY27 averaged 99,645 total viewers. In local news derby results, NBC5 and WFAA8 tied for first at 10 p.m. in total viewers while the Peacock won outright among 25-to-54-year-olds, the main advertiser target audience for news programming. Interestingly, NBC5 went with daytime anchors Brian Curtis and Kristi Nelson at 10 p.m. while rival stations all had their regular late night duos in place. NBC as usual swept the 6 a.m. ratings, with WFAA8 falling to fourth place in both measurements. WFAA8 rebounded to run the table at 5 p.m. and also had the most total viewers at 6 p.m. CBS11 broke through for a rare 6 p.m. win among 25-to-54-year-olds. Final guest Conan O'Brien laughs it up with departing host. Jay Leno's goodnight to Tonight racked up Friday's biggest D-FW audience, more than doubling the crowd for NBC5's preceding 10 p.m. newscast. Keeping his ample chin up while preparing for a fall prime-time debut, Leno drew 305,578 viewers in squelching competition from WFAA8's combo of ABC's Nightline (79,716 viewers) and the syndicated The Insider (66,430). Friday's second most-watched program, the Lakers' closeout of the Nuggets in Game 6 of their championship series, averaged 245,791 viewers on ESPN. 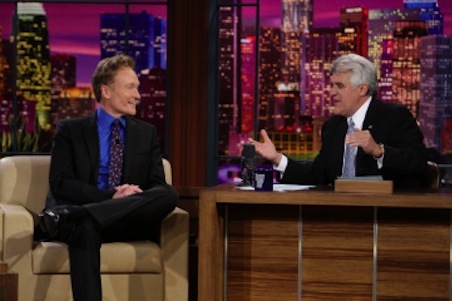 Leno also did big business with advertiser-craved 18-to-49-year-olds, drawing 142,613 viewers in this age range. The Lakers-Nuggets game was close behind with 132,889 viewers to rank as Friday's No. 2 attraction in the 18-to-49 demographic. On Sunday afternoon, the first-place Texas Rangers' home loss to Oakland averaged more total viewers than Fort Worth's Colonial golf tournament, which ended in a playoff. Rangers-A's drew 112,931 viewers overall, peaking at 166,075. The Colonial had an average of 86,353 viewers, with a 15-minute increment high of 132,860. As previously reported on unclebarky.com, the Rangers announced a new five-year deal Friday with TXA21, which will present 25 Friday night games per season, beginning in 2010. NBC's prime-time Sunday night telecast of the Red Wings-Pengins Stanley Cup faceoff averaged 53,144 viewers in D-FW. In Friday's local news derby, CBS11 took the 10 p.m. competition in total viewers while NBC5 won among 25-to-54-year-olds, the main advertiser target audience for news programming. The Peacock again swept the 6 a.m. Nielsens while Fox4 did likewise at 6 p.m.
Fox4 also won at 5 p.m. with 25-to-54-year-olds, and tied with NBC5 for first place in total viewers. In a rarity, WFAA8 recorded no local newscast wins. Its best showing was a second place tie at 10 p.m. in total viewers. No doubt about it, these are times of downsizing, content-sharing and double jeopardy for local TV newscasts around the country. As May fades into the unclebarky.com archives, we begin June by revisiting a 1987 closing credit roll call for Dallas-based WFAA8. No. 1, stations don't take the time to do this anymore. 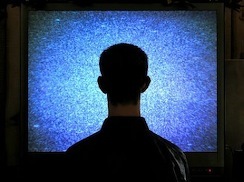 They're afraid you'll switch channels. No. 2, this one is notable for its sheer volume and breadth. A total of 23 anchors and reporters are listed alphabetically, from Barbara Bousquet to Peggy Wehmeyer. And this doesn't include the Fort Worth, Austin and Washington bureaus. The station's "Contact 8" also had a separate staff as the consumer watchdog of those times. The weather and sports departments likewise have separate headings under an operation headed by late news director Marty Haag. Photographers, editors, producers, etc. get their own subdivisions, too, as the names roll over aerial views of North Texas, ending with the downtown Dallas skyline. 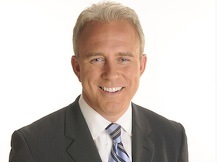 One of the Dallas-based reporters, Mike Devlin, now is WFAA8's president and general manager. Two more, Andrea Joyce and Scott Pelley, still work at the network level. Twenty-two years later, only John McCaa, Gloria Campos, Dale Hansen, Byron Harris, Brad Watson and George Riba remain on-camera at WFAA8. This was a mighty ship of state at the time, charting its own course, spending the big bucks and sharing with no one, including its Belo cousin, The Dallas Morning News. Now all stations seem to be in much the same sinking boats, many of them navigated from afar by the networks that have turned them into owned-and-operated serfs. So pause for a minute if you would -- and this takes a full minute -- to see what used to be WFAA8. The accompanying music sets the tone for a nationally renowned news operation that knew no bounds and walked with a swagger.